33% of sales were for list price or higher. 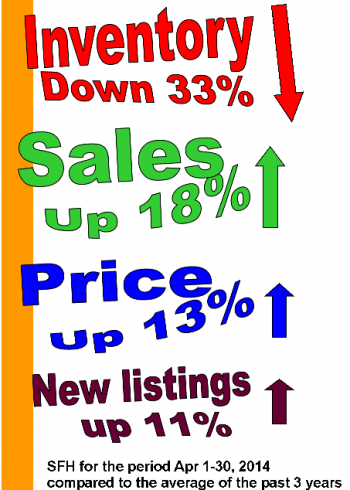 The only occurrence which has prevented all-out insanity is the fact that new listings are increasing slightly. In the price range below $500,000 homes are selling faster than they’re being listed. The absorption rate for homes priced between 0 – 500,000 is .8, so that means there is a 24-day supply of listings. In December there was a 36-day supply. 66% of the homes listed last month are already sold. If you’re a buyer, and can wait a few months, there’s bound to be more inventory come July and chances are good that prices will moderate accordingly. There’s never been a better time to get top dollar and a quick sale. This entry was posted in City of Calgary, Market update. Bookmark the permalink.